There is so much choice on the mortgage market that even if you're seasoned buyer understanding all the choice available can send your head into a spin. If you are new to the mortgage market all the products available can be overwhelming and worrisome when you are trying to pick the right one. The mortgage market has long since been criticised for being overly complicated and there doesn't seem to be much chance of it changing any time soon. Your best bet is to learn all you can about the different types of mortgages available and cross reference them against your circumstances and see which one is the best fit. A tracker mortgage is a type of variable rate mortgage that uses the Bank of England's base rate at a set margin - your mortgage will track the Bank of England's base rate and change accordingly. This means what you are quoted now for your mortgage repayments may change over the course of your mortgage tenure. Right now a tracker mortgage may seem like the most attractive option since the Bank of England's base rate is at a record low of 0.5%. If the set margin of the mortgage is 1% the interest you will pay on your mortgage will be 1.5%. Sounds like a great deal, right? It is, but the Bank of England base rates reflect the UK economy. As the UK economy recovers the Bank of England will raise the base interest rate and your mortgage interest rate will change reflect this. E.g. 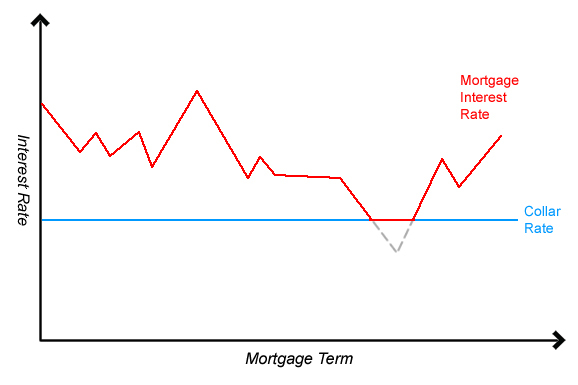 If your tracker mortgage is the Base Rate +2%, and the Base Rate is 2%, then you pay 4%, if the base rate changes to 3% your mortgage interest will reflect this and go up to 5%. The tracking rate can track below the base rate but more often than not it will track above, by a certain percentage. Tracker mortgages can give you an initial rate anywhere between 1 - 5 years or you may be able to get a 'lifetime' tracker, which means for the entire length of your mortgage you will be on a tracker rate. If you're on an introductory tracker rate, your mortgage will usually go onto a Standard Variable Rate or another (usually higher) tracker rate at the end of the initial term. When the interest rates are low you can overpay your mortgage and make a good dent in the debt, shortening the overall period of time it takes to pay off your mortgage. These days many lenders will allow you to overpay on your monthly installments without incurring a financial penalty - usually you're allowed to overpay up to 10% per year. When interest rates are low, you don't have to overpay, you could just pay less and save the 'extra' money. Due to the record low interest rates some lenders are putting a collar rate on their tracker mortgages. This just means that the mortgage lender sets a rate that the interest can't go below, so if the Bank of England base rate drops below that rate your payments won't go down any further. Should I Get a Tracker Mortgage? There are many advantages plus a few disadvantages to getting a tracker mortgage, the long and short of it is; it depends on your circumstances. Tracker mortgages often have the lowest interest rates especially now with the tracked rate being at 0.5%. A tracker mortgage doesn't offer total rate security, if the base rate suddenly raises so too will the interest rate you pay. If you have additional cash each month that may be able to cover an increase in interest and possibly your monthly repayments then a tracker may be a good option. If you are on a tight budget and you need to know your exact outgoings each month this may not be right for you as your monthly repayments may change in line with interest rate changes. If you want to leave your tracker rate mortgage early you are likely to be charged an early repayment fee, but some lenders, offer a droplock feature which means if the interest rates increase they let you move to a fixed rate mortgage without paying an early repayment charge. If you are interested in receiving more information about tracker mortgages we can help put you in touch with one of the mortgage advisers that we are affiliated with. They can provide you independent unbiased information on which mortgages is more suited to your needs.